Big buttons on the cordless handset of this amplified telephone make dialing easy. And just in case, the talk-back buttons allow you to hear the numbers you dial read back to you so you can be absolutely sure you're not accidentally misdialing. As for incoming calls the Caller ID Announce feature helps you screen calls and ensure you only answer calls from people you really want to speak with - no more getting stuck on cold sales calls! Plus, if you're in the middle of doing something, the speakerphone feature allows you to carry on your conversation while keeping your hands-free for the task at hand. With the integrated digital answering machine on the base, you'll never miss an important message from family and friends who are trying to reach you. 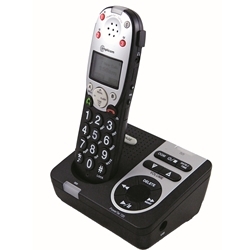 This amplified speakerphone offers superior hearing aid compatibility that meets and exceeds the TIA-1083 standard, the 760 produces crystal clear communication with less than 1.5-percent distortion. 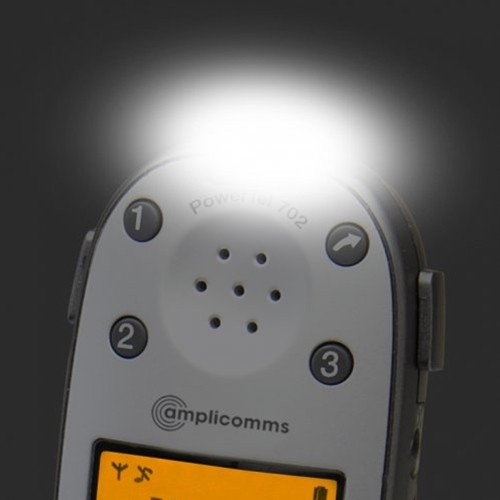 Amplicom's new PowerTel 7-Series are the only amplified telephones that offer pre-programmed multiple user profile buttons that memorize volume, tone control, and boost for more than one user.